After spending a year in Bowling Green Park, the Fearless Girl is moving to the New York Stock Exchange. New York City Mayor Bill de Blasio announced last week that the 50-inch-tall sculpture will be relocated to a “long-term” home outside the Stock Exchange by the end of the year. His announcement confirms a report in The Architects’ Newspaper last month. The popular bronze sculpture, which depicts a girl standing defiantly with chin out and hands on hips, became a magnet for visitors after it was installed at Broadway and Morris Street just before International Women’s Day in March of 2017. 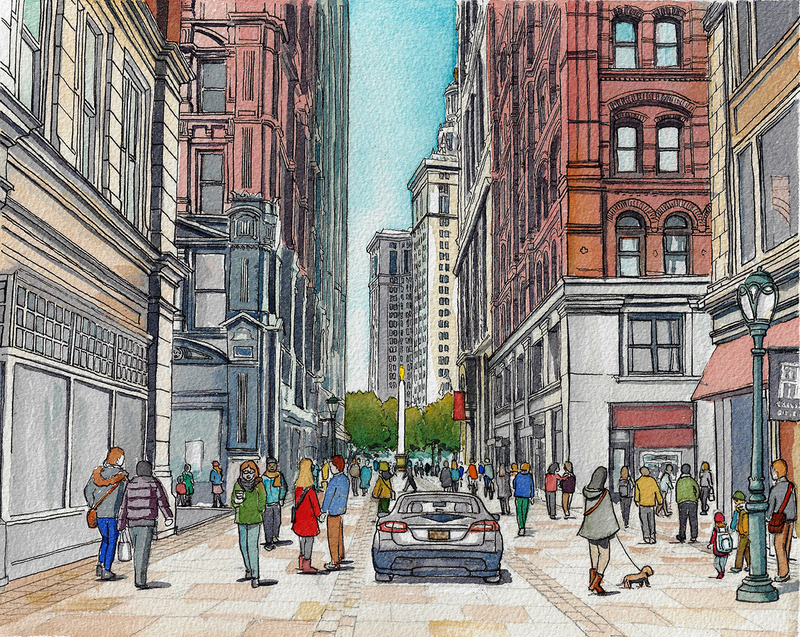 But it also raised safety concerns for city officials, who didn’t think the narrow public space on Broadway could accommodate the high number of pedestrians who were visiting, many seemingly oblivious to the vehicular traffic all around. “We are proud to be home to the Fearless Girl. She is a powerful symbol of the need for change at the highest levels of corporate America—and she will become a durable part of our city’s civic life,” de Blasio said in a statement. “This move to a new location will improve access for visitors and ensure that her message and impact continues to be heard.” The sculpture by Delaware-based artist Kristen Visbal was commissioned by State Street Global Advisors to raise awareness of the need for more women on corporate boards. In the year since it was installed, more than 150 companies have added a woman to their board, according to State Street president and CEO Cyrus Taraporevala. “Our hope is that by moving closer to the NYSE she will inspire many more companies to take action,” he said in a statement. The Stock Exchange at 11 Wall Street is an appropriate location for the sculpture, said president Thomas Farley, in a statement. “The historic corner of Wall & Broad saw the swearing in of our country’s first president and the birth of our capital markets, and is joined now by a striking symbol of our ongoing journey toward greater equality [and] broader inclusion,” he said. “We eagerly await the arrival of Fearless Girl to her fitting new home.” Much of the sculpture’s impact is due to its location facing another work of art, Arturo Di Modica’s Charging Bull, positioned as if standing up to the animal. There has been talk about moving the bull with the Fearless Girl sculpture, so they can stay together, but no decisions about that have been announced. “I’d love it if she could stare down the Charging Bull for the rest of time,” said Manhattan Borough President Gale Brewer, as part of the mayor’s announcement. “But even if she can’t, I’m glad she will stay in the neighborhood and remind those who pass by the Stock Exchange that it’s past time for companies to put more women in boardrooms and in charge.” The Fearless Girl has become something of a cottage industry for the artist, who is now selling “limited edition” reproductions of the sculpture, ranging from desktop versions to full size. 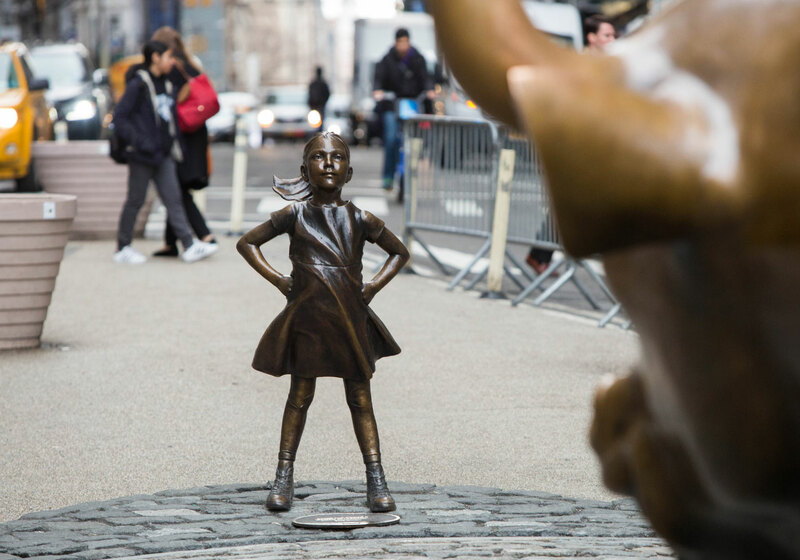 The smaller version is about 22 inches tall and costs $6,500, with 20 percent of the proceeds going to charities that support “one or any of the gender diversity goals Fearless Girl stands for,” according to a website set up by the artist. According to CNNMoney, the artist has sold three copies of the full-size version, including one that’s already on exhibit in Oslo, Norway. Twenty-five will be cast in all. The artist also has plans to sell smaller reproductions and children’s books based on the Fearless Girl character, the network reported. Those who want another sort of connection to the Fearless Girl can purchase a signed black-and-white photo of the sculpture, taken by Federica Valabrega, for up to $5,000. Or they can do what thousands have done and take their own. Scaffolding is going up around a landmarked modernist plaza in lower Manhattan, signaling a revamp that's been a long time in the making. Previously, SOM took on its own vintage work for plaza modifications at 28 Liberty Street (formerly One Chase Manhattan Plaza), a Financial District building that opened in 1964. Those plans, which were approved by the Landmarks Preservation Commission (LPC) in 2015, featured three large glass pavilions to provide additional access to below-grade retail, among other modifications. But the development did not go according to plan. The Architect's Newspaper reported in January that the pavilions were abandoned by owner-developer Fosun, in light of new rules that make it harder for owners to change city-imposed deed restrictions. In case readers missed it, a TL;DR version of the plaza saga can be found here (and here). A recent site visit revealed new plans for the plaza. One posted rendering showed a restored parapet—with not a glass pavilion in sight. Based on the character and style of the rendering, it is almost certain that the rendering was completed by SOM, but at press time, multiple requests for comment on the latest developments were not returned. [Update 2/27/17: AN has learned that the rendering is not by SOM and that there are no additional details on the rendering at this time.] Permits on file allow for the construction of scaffolding around the site, as seen at the corner of Nassau and Liberty streets, above, and on the southeast side of the plaza along William Street, below. As of right now, no additional permits for plaza construction have been filed, although the signage states that work is expected to be complete later this year. Images on SOM's website, however, still show the older version of the design. Fosun declined to comment on the ongoing work. This is the twenty-seventh in a series of guests posts that feature Archtober Building of the Day tours! On today’s Building of the Day tour, Beth Franz, RLA of Quennell Rothschild & Partners (QRP) walked us through the past, present, and future of The Battery. The Battery is built on the site of what was once Fort Amsterdam, later renamed Fort George once the British took over. One of the first things Franz pointed out to us is an original stone placed at what was the corner of the fort. During the redesign process—a collaboration between QRP, Starr Whitehouse Landscape Architects and Planners, and WXY architecture + urban design (WXY) with the Battery Conservancy and the Parks Department as clients—QRP decided to completely expose the stone, which made it vulnerable to damage, but it enabled visitors to the park to have a connection to the old fort. We then walked to Castle Clinton, passing by The Battery Oval. The two-acre site acts as a connection from the main entrance to the park at Battery Place and State Street to Castle Clinton. During the Robert Moses era, this portion of the park was a two-lane pathway, mostly devoid of greenery. The oval is mounded, which helps it to act as an amphitheater and inside the oval there are 300 blue plastic chairs that have proven to be very popular with visitors. So popular in fact that they are being mass produced for anyone to buy. Franz then led us to the waterfront promenade, where she explained to us the different design phases of The Battery. After the dire financial times of the 1970s and 1980s when New York’s parks were suffering from neglect, The Battery Conservancy was established to ensure the park was kept in good shape for all New Yorkers to use and enjoy. In 1982, Philip Winslow led the first major redesign of the park with the goal of putting the landscape first and getting rid of the broken landscapes designed during the Moses era. The park is outlined with enormous 7,000-pound granite blocks that serve as a demarcating line between the busy public streets and the quiet garden-like atmosphere of the park. Along the perimeter are various monuments to different people and events. QRP restored these monuments to their original design and placed them at the end of streets that terminate at The Battery. These are designed to help bring visitors into the park and capture their attention. Walking along the bike path, Franz told us how integral it was in the design process. With safety for bikers and pedestrians in mind, QRP added visual cues for pedestrians that they are entering the bike path. They also wanted cyclists to be aware of those who might be in the path: There is granite striping on the paths and rumble strips to alert cyclists as well. Additionally, the path gets quite narrow in portions, which forces cyclists to slow down and be aware of their surroundings. Along the bike path is The Battery woodland, which consists almost entirely of native grasses and plants. The vision is that this will resemble a meadow that Europeans might have found on Manhattan Island when they first arrived. This area does not need to be mowed and it does not use fertilizers or chemicals to maintain the trees and grasses. We ended our tour at the Tiffany Gardens. These gardens also consist of native plants and are mounded, much like the oval. The mounding serves two valuable purposes. Firstly, since the subway tunnels are just inches below the park, the mounds provide enough soil for the plants to take root. Secondly, Franz explained that they create something called “conceal and reveal.” If the landscape is totally flat, a viewer can see the entire park and not be as enticed to enter. If a mound is partially blocking their view, they become interested in what lies beyond and enter to explore the area. 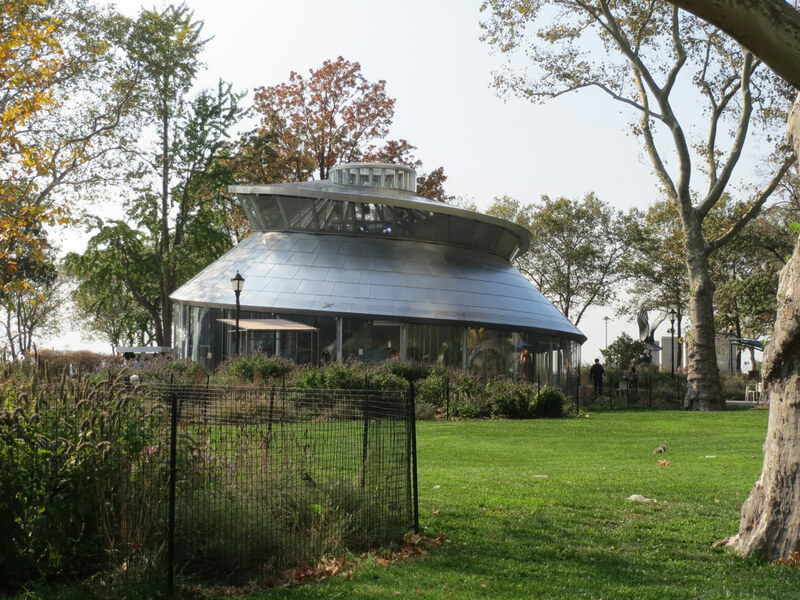 The new SeaGlass Carousel designed by WXY is located next to the Tiffany Gardens. Across from the carousel is the last unfinished part of the park, which will be a playground, meant to encourage imaginative play for children of all ages. Among the hustle and bustle of the Financial District, The Battery offers a wonderful respite and it truly is one of New York’s most beautiful parks. About the author: Jacob Fredi is the Public Programs and Exhibitions Coordinator at the Center for Architecture. When he’s not on Building of the Day tours, you can find him playing board games (Class Struggle!) and brewing his own beer. What’s the future of this landmark SOM plaza? In the New York City mayor's office, the council chamber, and one borough president's headquarters, officials are hashing out critical—and competing—land use reforms that could impact at least one major development in lower Manhattan. One reform is a slate of new rules from the mayor's office while the other is legislation in the city council; both are making their way right now through the review and approvals process. Currently, there is no unified process for the removal or modification of deed restrictions (the legal covenants that outline the use of land). As deed restrictions limit the use of a property, potentially reducing its value, there is often incentive to have those restrictions lifted. Deed restrictions are also widespread: The Department of Citywide Administrative Services (DCAS) and other city agencies have put (or have grandfathered in) deed restrictions on thousands of city properties, both through the sale of city-owned parcels and through the Uniform Land Use Review Procedure (ULURP). The mayor's office has introduced agency-level reforms to address shortcomings in the deed restriction modification process. DCAS is holding a hearing next week on these reforms. The mayor's rules call for a review process with a public hearing, plus a stipulation that the community board, borough president, and appropriate councilmember be notified of the pending changes. Parallel to the mayor's reforms, Manhattan borough president Gale Brewer and city councilmember Margaret Chin are advancing legislation that would, among other measures, subject deed modifications to a more rigorous public review. 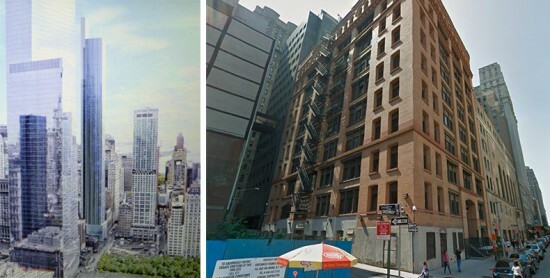 Although Chin and Brewer’s bill, Intro 1182, grew from public outcry over the lack of oversight around the removal of the Rivington House deed restriction, Chin's district also includes 28 Liberty (formerly known as One Chase Manhattan Plaza), another flash point property. 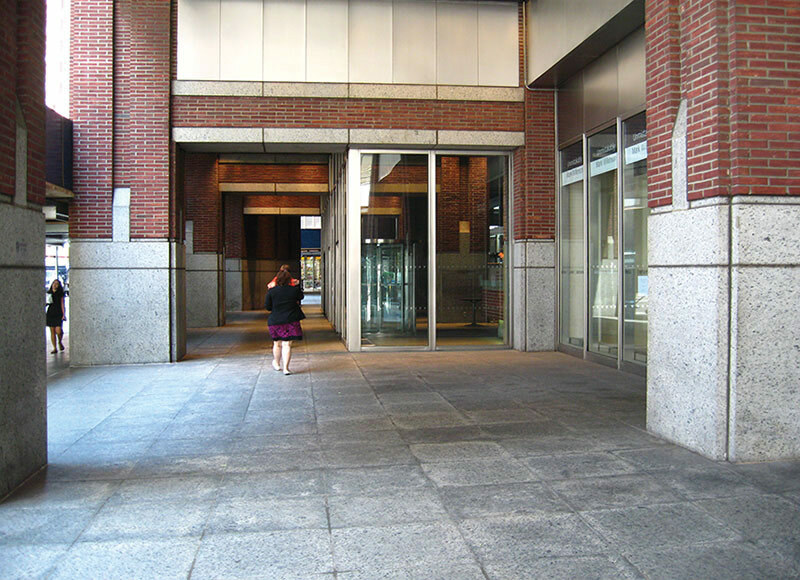 Its owner, global developer Fosun, is pushing to modify the deed restriction to construct 11- to 17-foot-tall glass entrances to below-ground retail on the landmarked plaza. Both the mayor’s rules and the Intro 1182 have special importance for Manhattan Community Board 1 (CB1). 28 Liberty lies within the CB1's boundaries and, in a mirror of the citywide conversation, the property has been a controversial issue for the board since the Landmarks Preservation Commission (LPC) approved changes to the landmarked plaza last year. At the CB1's Planning Subcommittee meeting last week, CB1 board members debated a resolution on deed restriction modifications that will go before the full board at their October 28 meeting. In drafting the resolution, board members repeatedly raised three points: The difference between a "major" or "minor" deed restriction, how that difference should be determined, and by whom. Currently, there's no system in place determine that difference—a minor modification to some could be a radical change in use to another observer, as the ongoing discussion around 28 Liberty's pavilions illustrates. "From what we've seen, putting a deed restriction in place seems to always benefit the public," said James Caras, the borough president's general counsel and director of land use. He added that the burden of proving the benefit of substantial deed modifications or removals should fall on the entity seeking the changes. The borough president's office believes that deed modifications that change the use of a property would "probably benefit" from public review under Brewer and Chin's proposed law. If a developer wants to change the use from public to private, for example, that action may be subject to ULURP, while a continuation of public use may not be. In soliciting the public's voice, Intro 1182 has precedent. Right now, deed restrictions that were the result of a ULURP must be removed through the same process. Intro 1182 would subject major modifications, which are typically granted per the administrative procedures of the DCAS, or the relevant agency, to a ULURP—what they call "the gold standard of public review." In September 2016 testimony given to the Council Committee on Governmental Operations and the Committee on Investigation, Brewer and Chin raised considerable objections to the proposed DCAS rules. The rules' foundations, they said, would not be as strong as the competing law passed by the council, as rules could be changed at any time by the agency itself or by the next administration. As CB1 planning committee member Reggie Thomas pointed out, a ULURP process can be prohibitively costly and time-consuming. Yet, during the meeting there seemed to be a consensus from the board on some kind of public review when the proposed deed changes involve a switch from public to private use. CB1 chair Anthony Notaro called the decision-making process for other properties "a gray area," but said that regardless, the community "should be on the front line, one of the hurdles, before any decision is made." Specifics like these, Caras said, would be worked out in legislation. In light of the lifting of deed restrictions at Rivington House and the Dance Theater of Harlem, as well as continuing conversation around 28 Liberty, Brewer's office is reaching out to each community board in its jurisdiction to answer questions about the pending reforms. Until the city and the council hammer out their respective plans, though, there's no clear process on how to modify deed restrictions, so projects like 28 Liberty are treading water. While plans on file with the Department of Buildings (DOB) show that interior upgrades are progressing, construction on the plaza's glass pavilions appears to be on hold, because the project can only move forward if a deed restriction regulating the height of objects on the plaza is removed. The LPC-issued Certificate of Appropriateness from November 2015 states that no work on the plaza can begin until the agency has received and reviewed the final DOB filing set of drawings, specifications, and a scope of work that details the restoration of the on-site Dubuffet sculpture and Noguchi garden. A spokesperson for the LPC confirmed that the agency has not received DOB specs or drawings. 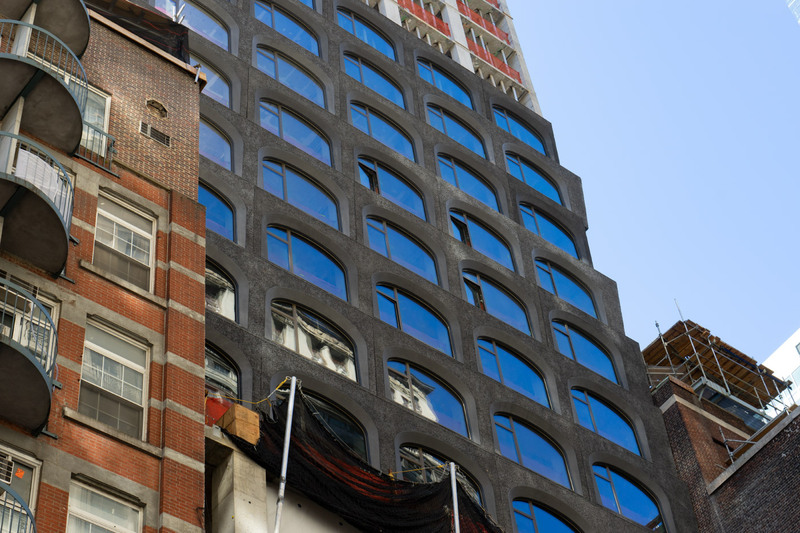 In a statement, Fosun said "all Landmarks Preservation Commission comments regarding the Dubuffet sculpture and Noguchi garden have been resolved to the satisfaction of the LPC," adding that interior work continues to "prepare for the exterior work." At press time, The Architect's Newspaper (AN) was able to confirm that the scope of work for the restoration of the Noguchi garden was on file with the LPC. (As a freestanding object, the Dubuffet, it turns out, is not part of the landmark's designation and is thus outside of the LPC's purview.) 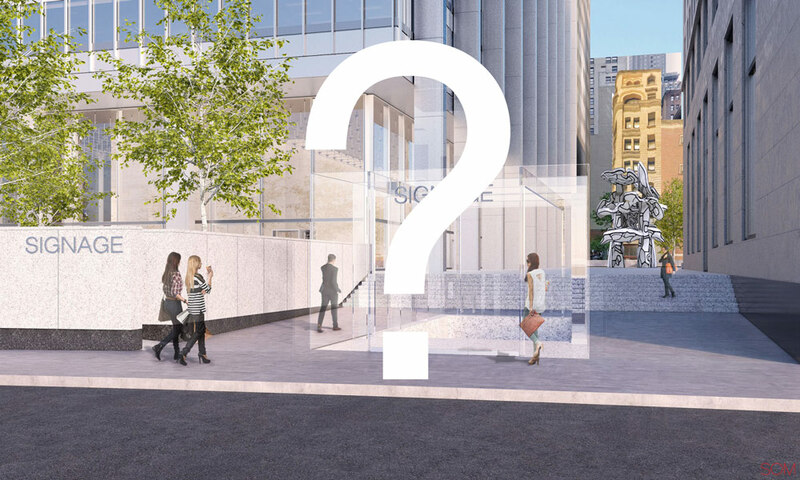 Fosun declined to comment on the status of the glass pavilions, reasons for the delay, and whether construction documents exist for the plaza modifications. New York–based SOM, the architect for the project, also declined to comment. In July 2016, Bloomberg News reported that Fosun is preparing to sell $6 billion in assets between now and the end of next year in an effort to raise its junk credit rating and alleviate its massive debt, although AN was able to confirm the seeming hold-up on the plaza is unrelated to Fosun's financial status. On Tuesday night the CB1 planning committee revealed its resolution to the public. It called the reforms drafted by the mayor's office and DCAS "neither sufficient nor in the public interest" due to the fact that they may be easily changed by another administration. The board instead supports a legislative process and expressed support for elected officials as they research the kind and quantity of deed-restricted properties (there's no unified database right now) to create "an appropriate process" for deed restriction modification or removals. The full CB1 board approved the resolution unanimously. 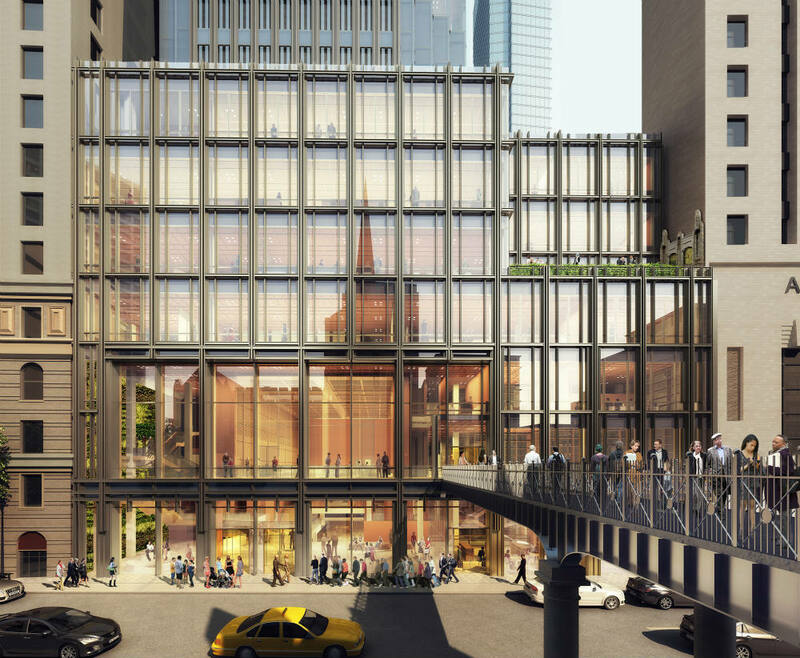 Trinity Church Wall Street, located in New York's Financial District, has released images of what their new Parish Centre at 74 Trinity Place will look like. Designed by New Haven–based studio Pelli Clarke Pelli, the building will offer offices, a gym, cafe, gallery, a children's area, spaces for education, performances, and community activities, as well as offices for their Ministry in downtown Manhattan. 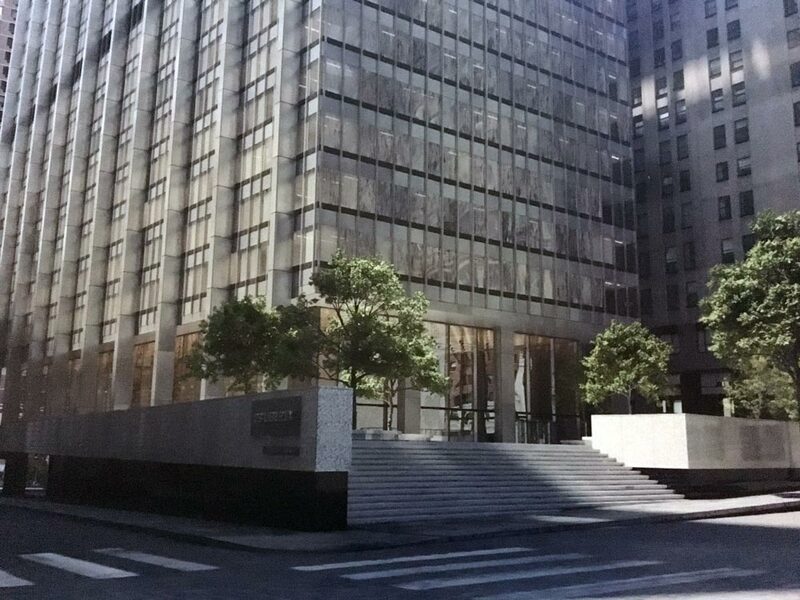 74 Trinity Place will rise to 26 stories and feature 310,000 square feet. Located at the building's base will be the Parish Center and the first nine floors will accommodate most of the programming listed above. Meanwhile, the remaining stories will be used commercial purposes, supplying 160,000 square foot of office space. "The new project forms an ensemble with Trinity Church and Churchyard, creating an enlarged public setting for the ministries of the church," said Pelli Clarke Pelli in a statement. "The resulting design, emerging from a highly collaborative design process, is conceived of as a companion to the historic church building—a supportive and resonant element in a larger urban composition, a sacred and welcoming public space." Within its Wall Street setting, the architects also said how the "new parish building will form a contemporary backdrop for the historic church." Light metal framework will encase glass paneling to form the building's facade. As a result, the tower "resonates with the intricate stonework of Trinity Church Wall Street," a Gothic Revival Episcopal landmark that boasts one of Manhattan's most impressive spires that has stood tall since 1846. With the Parish's programming taking place on the lower levels, the glass fenestration will allow the public to view church activities and facilitate further community engagement. The design has been two years in the making. Both the Church and architects worked with the community to establish the building's aesthetics and program, tailoring it to the needs of all stakeholders including the Trinity’s congregation, ministry partners, neighbors, and the city. The Reverand Dr. William Lupfer, Rector of Trinity Church, said: “Our building is a statement of Trinity’s dedication to serving the people of this community, this neighborhood, and the city of New York for a fourth century. Having been in conversation with our neighbors every step of the way, we are creating a dynamic, engaging home for Trinity’s ministry activities.” According to a press release, building plans are currently pending approval. Groundbreaking is currently scheduled for early 2017, with the 74 Trinity Place being due for completion in 2019. Rumored Financial District supertall by FXFOWLE gets a trim, but will the views make up for it? Rumor had it that the Financial District would be getting a 1,000-foot-tall tower on Trinity Place. This week, renderings were revealed for the FXFOWLE-designed building, and, at 500 feet, it's considerably shorter than anticipated. As a consolation to supertall lovers out there, every unit will have water views. Seventy Seven Greenwich Street, a 285,000-square-foot mixed-use building in the Financial District will rise 35 stories, the New York Post reports. The 500-foot-tall project will include 7,000 square feet of retail and 85 condominiums, as well as a 476-seat elementary school on floors one through nine. The glass facade design may change, as the architects have not yet decided on the precise tint and configuration of the glass panels. Deborah Berke Partners will take the lead on designing apartment interiors and amenities spaces. In addition to standard offerings like bike storage, the tower will also include a dog spa. The project's completion date is set for 2019. Renderings show 77 Greenwich Street, with a street address at 28–42 Trinity Place, squatting over the landmarked Robert and Anne Dickey House, a federal style townhouse at 28–30 Trinity Place that dates from the early 1800s. Plans call for the interior to be repurposed and the facade restored, though it looks like all other buildings on the block will be demolished. 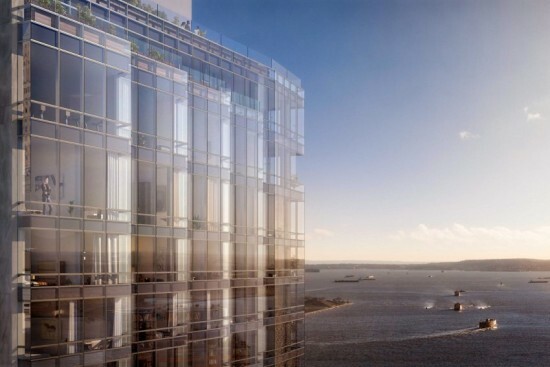 Though this building has a prime location, it is hardly FXFOWLE's biggest New York project. This month, Governor Andrew Cuomo announced that the firm will spearhead the one billion dollar Javits Center expansion and renovation. It may have been a jarring reminder of the two deadly crane accidents two springs before, but fortunately little more. A smaller mobile crane toppled onto 80 Maiden Lane in the Financial District on Saturday evening, but it caused little damage and no fatalities, unlike the collapse of two tower cranes in March and May 2008, which claimed seven and two lives, respectively. The exact cause of this latest accident remains unknown, but it was believed to be a combination of human error (the boom was not sufficiently lowered) and mechanical failure (bad hydraulics). In a twist of fate, the crane fell onto the building occupied by the city's Department of Inspections, which is charged with routing out the corrupt inspectors who let the prior accidents happen, though there appears to be no malfeasance in this incident. Two days later, two Brooklyn condos under construction collapsed, one injuring two four workers. This reminds us that last year there were but three construction fatalities in the city, down from 19 in 2008, partly because of stricter safety standards but also less work. While such construction accidents are unacceptable, they are also, as the mayor has said, the cost of doing business. The good news, then, appears to be that the city may finally be back in business.